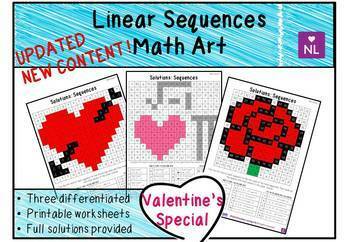 Complete set of three differentiated sequences worksheets, pupils are required to solve sequences questions such as next term, missing term, nth term etc. 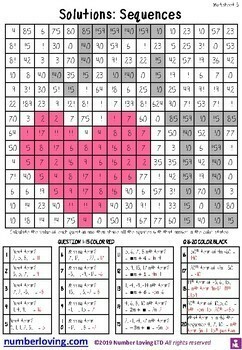 Each worksheets produces a different Valentine's themed picture. 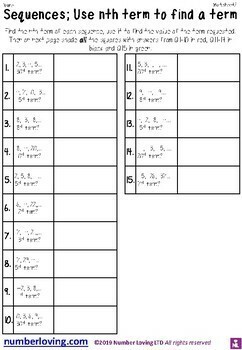 The worksheet is available in two versions. 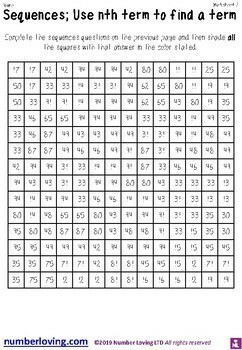 The first where pupils answer the questions of a separate sheet to the coloring, this gives the pupils a place to show their workings and the teacher the option of requiring pupils to complete all questions and get these checked before they are given the coloring aspect of the task. the second version is condensed to one page, saving printing. Ideal as a plenary activity to determine what learning has taken place, alternatively use to determine pupils prior knowledge to a topic and of course great for revision.